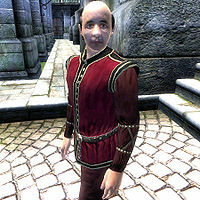 Trenus Duronius is an Imperial commoner living in the Imperial City's Temple District. Despite his expensive address and upper-class attire, Trenus is a secret skooma addict and his mansion is filled to the brink with wine and skooma chests. Because of this addiction, Trenus travels regularly to Bravil to visit the city's Skooma Den. His life as an addict in the big city is centered on keeping up appearances and while he seems to prefer the comfort of his house, he takes several trips to the various districts. He sleeps in the upstairs area of his house, conveniently close to the many chests with the drug, every night between midnight and 6am and always starts the day with a two-hour breakfast on the ground floor. On Morndas and Fredas he ventures outside at 8am and strolls around near the temple until 1pm when he returns to his house and spends the rest of the day wandering about. On Middas, at 8am, he crosses the street and enters the Temple of the One for a morning prayer. He leaves at 12am and takes a one-hour walk outside until he returns to the comfort of his house at 1pm. On Tirdas and Turdas, he ventures outside at 8am as usual, spends an hour near the Temple and then travels to the Market District at 9am. Here, he will stroll around and chat with the many merchants and customers, eating a two-hour lunch at the Feed Bag at noon. At 3pm he returns to his house and stays there until bedtime. On Loredas and Sundas, Trenus never even bothers to leave the house and stays inside all day long. There are three exceptions to his daily routine: During Light the Dragonfires, he will wisely stay indoors while the entire Temple District is in a state of chaos. He was also intended to play a role in the unfinished "Imperial Couriers" quest; at midday on the 14th of each month, as long as Talasma is still alive, he will head to the Black Horse Courier and stay there for a brief moment before he resumes his usual schedule. On the 19th of each month, when the clock strikes midnight, Trenus gives in to his skooma urges and leaves the Imperial City for a few days in the company of similar-minded people inside Bravil's infamous Skooma Den. He crosses the Talos Bridge before heading southeast on the Red Ring Road, passing the Ayleid ruins Fanacasecul and Vindasel on the way. Once he reaches the small settlement of Pell's Gate, he turns south on the Green Road until he finally reaches Bravil after nearly fourteen hours of traveling. Once there, he quickly enters the Den and spends the next two days downing skooma with the other addicts. At midnight on the 21st, he heads back to his life in the big city. His attire includes a burgundy linen shirt, a pair of matching linens and russet felt shoes. He carries his house key, a small amount of gold and, similar to his friends in Bravil, a pewter mug for the skooma. When first met, it becomes apparent that he lives in a constant haze: "Wo! You SCARED me! I was off in my happy place, and you just popped in and wrecked my whole thing!" When asked about his city of choice he'll say, "Big city. I really LOVE the lights at night, shoo-shoo. The City of Love. Got it? Love? Light? Night? Big. Big, big, big, BIG!" If the Skooma Den's lock is not opened by you, then Trenus will never return to the Imperial City, as he is not one of the Bravil Skooma Den faction that owns the door to the den. Since he cannot use the door, Trenus will always be found outside the Den drinking skooma with fellow addict Gelephor. If Trenus is added to the faction by using the console, or through a mod, he will be able to enter the door and would also be able to return to the Imperial City. Esta página foi modificada pela última vez à(s) 18h43min de 16 de maio de 2015.